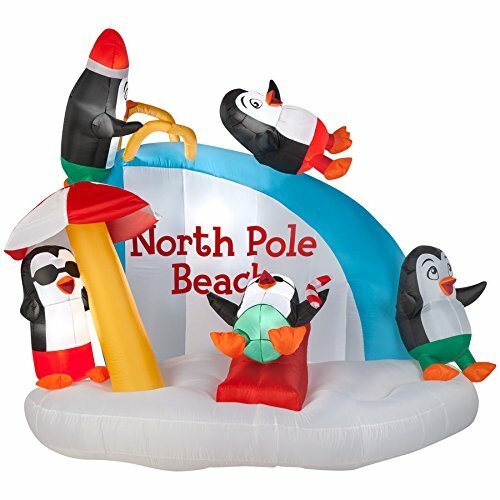 Be entertain with this Inflatable Penguins On Vacation Beach Scene. It is made with weather resistant material that is suit for your indoor and outdoor holiday decorations. The airblown Penguins is portable and self expand in seconds. It measures 7.5-foot wide x 6-foot tall and includes everything needed for an easy setup. This inflatable christmas decor comes with a reliable built-in fan and internal lights to create a glowing nighttime display. Includes yard stake, stand and tethers to hold it down. Self inflates in minutes for a quick setup and deflates for off-season storage. This must be plugged into an electrical outlet to stay inflated. Children and adults alike will love this playful outdoor scene.